The John Deere Historic Site in Grand Detour, Illinois, opened for its 48th season on May 2, as the place where the iconic brand got its beginnings and has been memorialized by the company. The Rock River Times reported that the site will be available for viewing by fans of the brand, history buffs and farmers from across the U.S. The home that John Deere built still stands, and was designated a Registered National Historic Landmark by the National Park Service. This famous residence was where the innovator built his first “self-scouring” steel plow. Tour guides provide fans of the brand with an entertaining and educational perspective of life on the prairie in the surroundings of the 19th century, according to the news source. The site was opened to the public in 1964 and has received several renovations, including, most recently, sidewalks to make all areas of the grounds more accessible to visitors. The blacksmith shop where John Deere worked in the early 1800s was unearthed in 1962 by a team of archaeologists from the University of Illinois, and the site features a series of artifacts and pictorial interpretations of the progression of early machinery from the innovator. The site provides visitors with a chance to see what Deere might have been like in his shop, as a resident blacksmith demonstrates what it took to be a skilled iron worker between five to seven times a day. 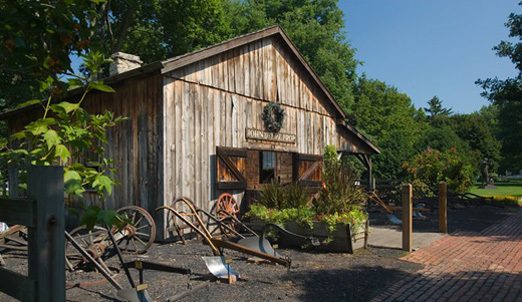 Guided tours of both the blacksmith shop and his home – finished in 1836 and refurbished with period decor – are available, and visitors can also see a heritage garden at the site that provides a view of what much of his surroundings would have been like when he started work on his agricultural equipment. The John Deere Historic Site will host two special events this year, including a Hammer-In in August. Blacksmiths from around the Midwest will gather to celebrate their trade and the event will also commemorate the 175th anniversary of Deere & Company. The former Vermont resident’s impact on the agricultural sector was significant, but the humble beginnings of John Deere are something that many Americans can relate to. A trip to Grand Detour provides a glimpse into the life of an innovator who grew an iconic brand out of a single plow.